Posted on March 2, 2010 at 11:38 am. 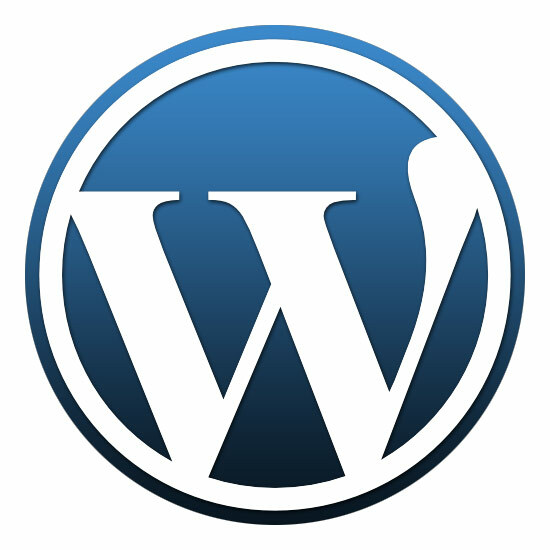 WordPress is more than just blogging software. It’s now a genuine, simple and cost effective way for teams of people to manage content. WordPress isn’t perfect — you only get the one content area, which isn’t ideal. Here I’ll explain a work around that’s both simple and effective. In lieu of the WordPress ebook I’m working on (which is close to going live, by the way), here’s an advanced topic for the power WordPress users amongst you. If you’re not a power user, but understand the benefits of what this article discusses, let me know and I can certainly help out. Here I am, re-working the Octane website from scratch. I have all these design ideas, but they all break when I take into account how WordPress 2.9 doesn’t allow for multiple content areas, which is a real shame. A few months previously, I’d been playing around with custom fields for a client website — I’d used them to store information for the main navigation on the website, such as a shorter name for each Page to use in the navigation, and a value to tell the Plugin which Pages to include and exclude. So this got me thinking. Can I use custom fields as content areas? And the answer is a big fat yes! That said, anyone who’s used custom fields will know that you don’t get a fancy editor for your content; all you have is this plain text box. That itself could be the cue for a Plugin, but right then and there, it wasn’t an issue. So that we know where all of this is going, I’ll explain what I was doing. I wanted to add blocks of text (containing headers, regular paragraph text and lists) to my Pages and then be able to add graphical devices in between. First things first, you need to add your content. Either edit or add a new Page or Post. Scroll down to the “Custom Fields” box. Under the “Name” label, either choose from a previous custom field from the drop-down / pop-up, or click the “Enter new” link button beneath it and type the name. Under the “Value” label, either type in or paste you content. Now click the “Add Custom Field” button. If this is a new Page or Post, be sure to either save draft or publish. If it’s a previous Page or Post, you don’t even need to update. 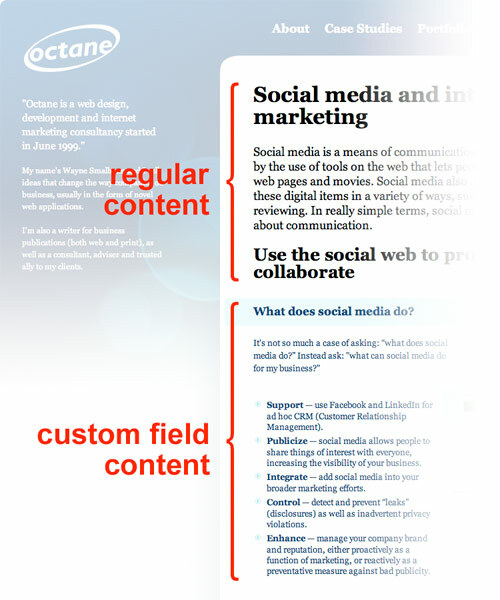 Now that you have your content added into custom fields, the next thing is to get that content into your theme. I don’t know where you’re placing any of this, so all I can do is explain how you pull your custom field content in. Select the place in your Page or Post theme file where you want your custom field data to appear. Paste the code below into that area. Swap out where it says: “features” with the name of your custom field. Keep in mind, you can call custom field meta data from outside of The Loop — which is to say, you don’t need to be inside the loop that WordPress uses to summon up data about a particular Post or Page. But are custom fields searchable? By default, no they’re not. So if you’re using them to store lots of content — such as product data, for example — people searching your WordPress-driven website won’t find any of the carefully curated content you’ve added into your custom fields. Dilemma. However, there’s a fix for this, all thanks to John Hoff, who’s written a script that extends the scope of the WordPress search engine to grab custom field data, too — which you can download here. So, within the Array() item, just change names of the items within the single quotes. followed by a closing single quote. and the last single quote after its name. You’ve now learned how to turn WordPress into a more featured content management system, hopefully without breaking too much of a sweat. As always, if you get stuck, leave a comment and I’ll see if I can help out. Posted on February 21, 2010 at 8:43 pm. What with all of the new projects (landing pages, websites, print design etc), things have been moving quickly around here. So quick, in fact, I’ve had to totally re-think and re-design the entire Octane website from scratch. So, what do you think? And the reason for all of this furious industry is, well, you! The writing side of things is gradually (there are often consequential lead times for certain publications) picking up, thanks to Emily Cagle Communications, but the previous website and blog just wasn’t cutting it — if I want to appeal to the publications, I have to make it worth their while pointing their readers to me. More emphasis has been placed on simplicity, speed of navigation and clarity. So when you’re reading an article, you’re not being distracted by links and buttons left and right. Instead, you just read down through the article, and when you’re done, you have the option to share the article on a bunch of popular social networks, or contact Octane for more information. All of which is neatly squeezed into the ever accommodating WordPress — fast becoming less weblog and more content management system. I’ve been able to kid and cajole it into doing things you won’t be able to do with your common-or-garden variety installation of WordPress. Oh no. Much of what you see here is WordPress after being given the Octane treatment. So what’s changed? Apart from everything, there’s a new home page, which is essentially the blog aspect, now called Knowledge. By pulling all of the content to the front of the website, all of the knowledge I’m pouring into Octane is right at your fingertips from the moment you step through the door. And if you can’t find what you’re looking for, use the search tool. Or use the category browser further down the page. Then there’s the Media section further down the home page, which is where all of my publication materials can be found. Each article is an excerpt taken from the publication itself, accompanied by a link to the PDF, ready for download. Further down the home page is the Community panel. Here’s where you can hook up with Octane and me, Wayne Smallman, on either Twitter or Octane’s very own Page over on Facebook. Or as close as is feasible. You see, things just keep changing. Which is fine, assuming you’re ready for change. I am. There’s still more stuff I want to do and the new Octane website has the potential to meet those needs head-on. If you’d like to know more about using WordPress to manage your website, or you’re interested in my web design services, let me know. Posted on June 16, 2009 at 12:12 pm. As I walked into the office, a Steve was in mid discussion with Claire about the cost of the bottled water she buys and brings into the office. While the water seemed cheap enough, Steve was busy working away on some numbers on a piece of paper. He had other ideas. Claire wasn’t sure of the idea of renting a water cooler, citing the monthly costs as the principle reason. Steve was sat there, running the numbers. In the end, the apparent cost of the water cooler worked out much cheaper over twelve months than buying bottled water. So now you’re wondering how a water cooler connects with business, apart from the cost savings. Well, it’s all a question of economics — what appears expensive in the short-term, can often have long-term cost benefits. As an example, you might want to be able to edit the web pages on your website, but to do that, it’s more than likely that you’d need what’s called a Content Management System to do that. You edit those web pages yourself, via a CMS, in your own time. The first option appears to be the simplest option, but when you consider the cost of me making those edits, and that those edits might not happen straight away, due to work schedules, the costs can rise. The second option can seem very expensive, because I’m tasked with developing a CMS for you, which might cost many hundreds of pounds. But you’re in complete control of your website, and over time, you’ll save money and be able to make edits at a time of your own choosing. So the convenience of having your own serviced water cooler is to a CMS what me editing your website is to bottled water, bought from the supermarket. While at the supermarket buying lunch, I looked to my side and saw a box full of butternut squash. I’m sure I’d seen them before, but I had no idea what to do with them. Do I cut them up like a melon? Do I mash them like potatoes? So I asked the assistant, serving me with my lunch. She instantly referred to a colleague of hers. They didn’t know either. This to me is a missed opportunity; butternut squash could be heaven for all I know! If only I knew what to do with it. So I suggested that recipes ought to be put next to the butternut squash, so people had some idea of what to do with them, and what else to eat them with — maybe something else in the store. The two women instantly agreed that would be a great idea. So I don’t sell buzzwords, I talk about the things those buzzwords can be made into, such as a web application for managing company assets, for bookkeeping, tracking stock inventory or for selling products via the web. Just what is a standard website anyway? Posted on March 3, 2009 at 2:47 pm. “So how do you charge for a standard website?” is a very common question, one which has no simple answer. Why? Because I’ve never developed two websites that are the same. There’s no doubting the similarity of some, in terms of the number of web pages, or the type of pages, but because my involvement in any given project can vary, there’s no one-size-fits-all approach to what I do. Sometimes, I’m required to provide the design and artwork, whereas other times, that part of the project might have been done by another design agency. Sometimes the copy (text) and the photography is supplied, whereas other times I’m required to assist in the copywriting and sourcing the photography. There are parallels with the print world; no two brochures are the same. How many pages? What stock of paper? How many colours? Any special colours? Is the copy supplied? Is the photography supplied? How many prints do you want? The list goes on. There are those that offer a one-size-fits-all approach. I don’t. Every company is different and thusly, their needs are different. The upshot is that I’m more expensive than some of my rivals. But it also means my clients get a better quality service, specific to their needs, not my own, or for the benefit of my own convenience. Once we move away from corporate websites and into more specialized services, like websites that the client can manage themselves, such as a Content Management System (often referred to a CMS), or a web application, then things become even more specific. But what does this mean for you and your business? Simple! Everything is taken into consideration and together we build a strategy that’s exactly the right fit for your business.